I attended an Advanced Instructor Preparatory Workshop this week at Heartland Therapeutic Riding by Sandy Webster and it’s been so inspiring and motivating! In all honesty, I never thought I’d be interested in (aka confident enough for) Advanced Level Certification, and certainly not so soon after getting the Registered Level Certification, but I got a grant to go. And I have to say, I HIGHLY HIGHLY recommend going to one, regardless of whether you ever plan to go for your Advanced or not! Registered Level Certification was only meant to be a stepping stone. Advanced level is where you get to the exciting stuff that made you want to become an instructor in the first place – purposefully impacting lives. Registered Level Certification focuses on safety, efficiency, teaching methods, lesson components, and practicing. 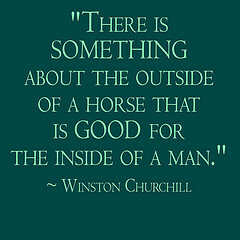 The horse and the environment naturally benefit the rider. You work on all this until you get comfortable. Advanced Level Certification takes it to the next step. 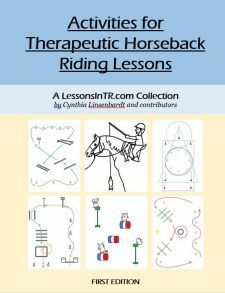 Now that you are comfortable with all the above, you focus on the intentional use of particular riding skills (including things involved such as the horse’s movement, volunteers, barn environment, etc.) to improve and enhance daily life functions and meet life goals. You purposefully pick skills they can go home and replicate in their daily lives. You are directly connecting what you do at the barn to what they want to do at home. For example, your rider would like to ride a bike. So you work on posting and 2 point for leg strength, and direct rein steering which is similar to using handlebars. Or, your rider wants to learn to tie his shoelaces, so you use direct rein steering to learn right from left and separating hand movement, and at the end of the lesson they learn to tie up their reins, and eventually start changing from shoes to boots and back before and after their lesson. Or they want to use an electric wheelchair steering toggle so you teach neck reining. The Advanced Workshop goes through this decision making process in detail. Guidance for how best to continue your therapeutic riding education after getting your Registered Level Certification in a way that will also prepare you for Advanced Certification. Even if you don’t plan on getting your Advanced, the next things to work on are the same, and the workshop gives you direction to continue your own self-studies. If you do plan on getting your Advanced, it’s better to know now what you should be working on rather than 10 year down the road realizing you would have done things differently. Knowing the Advanced requirements and testing process long before you certify. I feel like I have all the tools I need to prepare myself to enter Advanced Certification with confidence, as opposed to the Registered Level which for me was much more unknown and nerve-wracking. The in depth conversations about teaching, lessons, strategies, admin, and more from everyone’s discussion and questions are invaluable, inspiring, and offer fresh perspective and ideas. Meeting new people that you can use as resources in the future. The whole feel is very supportive. Evaluator gives demonstration of EACH of the components (including all 3 lessons! ), then everyone discusses and asks questions – a great opportunity to see how it’s done! FYI, you can audit or participate in the Advanced Preparatory Workshop – both methods count toward your certification, which must be completed within 2 years of attending a workshop. It was recommended to us that you attend a workshop before starting the Advanced Certification process, then work on all the things you need to work on until the time is right for you to certify, as opposed to setting the date then frantically working to get everything learned by that date – aka take your time to make it successful. If it’s too expensive, look into grants! I got a Professional Development Grant from the Indiana Youth Institute for attending a workshop than continues my education toward helping Indiana youth – a resource apparently not a lot of people know about. See if there’s something like it in your area! What about you? Have you attended an Advanced Workshop? What was your experience like? Thanks for attending the Advanced Prep Workshop at Heartland! You’re insights and comments were a great contribution to the group discussions. We are so excited to have a friend in another area to share resources and collaborate with. Good luck on your journey to becoming a PATH Intl. Advanced Instructor! Thank you so much for hosting! I know it took a lot of effort. It was great having you sit in and offer your insights as someone having gone through the Advanced Certification Process already. Best of luck to you and all the new exciting things going on at Heartland! I attended my Registered Instructor Certification at Heartland. What a wonderful, supporting environment! I am looking forward to working toward my Advanced Certification and would love to be at Heartland to accomplish my goal! Thanks for your comment! I’m glad you found it a good environment. I enjoyed my stayed when I was there. Good luck toward further progression! !